1950s! When dresses were full and pretty, and used SO MUCH fabric. I've made this fifties dress for Ell and her pals. The skirts are humongously full. 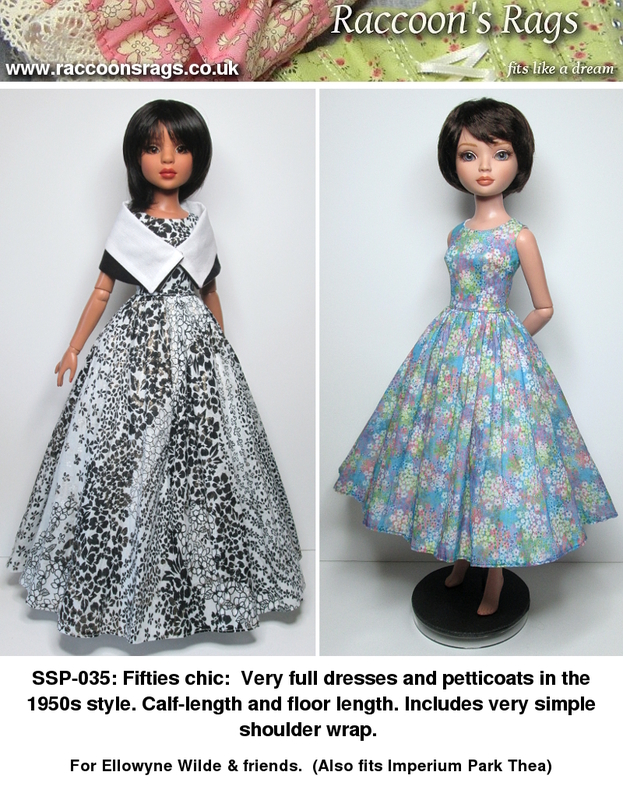 They are cut so nicely to give the classic fifties shape, and there are FOUR layers of skirt. The dress has two layers, outer and lining; the petticoat has two layers also. And I topped it off with this lovely and so easy-to-make shoulder wrap. Etsy will charge EU customers VAT (This does not affect America or other non-EU countries). I always recommend people to look in my Craftsy store anyway, as the prices fluctuate, due to the international exchange rates. I always suggest comparing prices. If you wish to buy directly from me, I can supply a PayPal invoice and email the pattern to you within 24 hours. Usually it will be faster than that, I'm just allowing for the potential differences in time zones. Two lengths are included in the pattern. Calf-length and floor-length. And the long dress looks lovely and contemporary without the petticoats. The Benefits office, in their infinite wisdom, have decided not to award me a benefit that I've been getting for five years now. Which has the knock-on effect of halving the benefit I am still allowed to receive. I am of course appealing, but it's a long, stressful and drawn-out process that can take up to a year. So I need to support myself in the meantime. Scary. Like - it's made me physically ill scary. I feel dreadful today. But if can maintain my modest income from the sewing patterns and outfits, I should be okay. I work as hard as I can with mental disability that affects me physically. I live very frugally, I don't buy clothes and make up, I don't go out. I don't drink. My social life is with the close friends I live with, and on my computer. So I hope people - wonderful people, I really do appreciate you all in the doll community - will continue to buy and enjoy my sewing patterns, and the outfits. You guys are actually paying a solid lump of my rent from this day on. And you've helped me pay off a massive credit card debt, so at least I don't have that hanging over me now.